1. Danity Duo of rings on Friday - left H&M, right By Boe. 2. Happy Hour Cocktails with a Buddy - we both needed one or five after a long week! 3. Saturday Cleaning. Look at that gleam on those floors, mopped by yours truly! love those loafers and that beautiful latte! hope your weekend was wonderful. I love the skinny rings, especially the knotted one! The shoutout to your mom is so cute haha. And I would like to formally request for more yorkie photos - it's kind of awful of me to say, but I really think yours is even cuter than my boyfriend's dog (much to his dismay) haha! Love love your outfit, that's my typical to-go outfit too! i need those rings and those shoes. notice i said need not want. this is a situation. Sounds like a great weekend! Love your pretty Boe ring! Looks like a great weekend... happy Monday! I love your delicate rings. 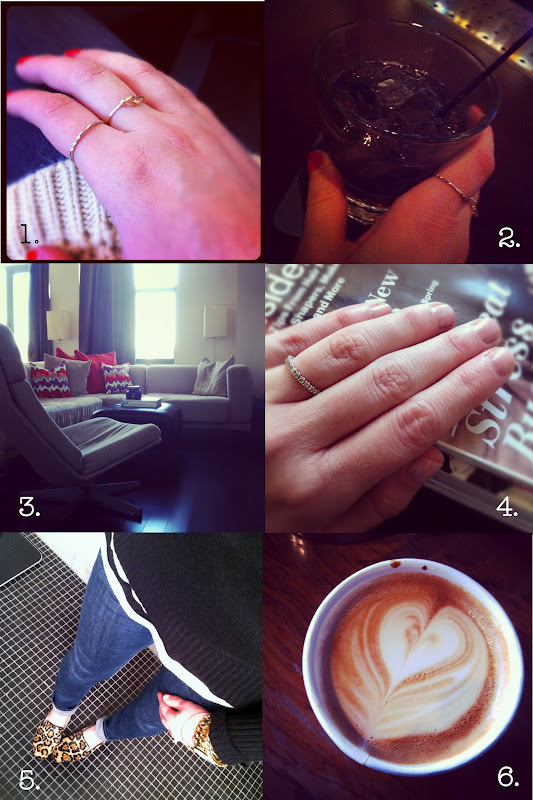 I love the knotted ring in #1! i need to get my hands on it! Well hello there LOVELY LOAFERS.... Looking for a pair right now myself. So in love. Come on by Little Miss Mama, I promise the Tea is always served HOT and the Cupcakes have a perfect Icing to Cake RATIO.